17 year old Phoebe lives with her mother and her aunt Cissy, a former opera singer at Covent Garden, in a big house in Bow, east London with several servants. When Cissy dies suddenly, Phoebe is devastated. Mama is struggling to make ends meet when Nathaniel Samuels, a wealthy businessman who knew Cissy, makes an offer – of a sort of job as companion to his invalid wife in their Herefordshire mansion. Mrs Lydia Samuels has never got over the tragic death of her young daughter. Phoebe finds herself accidentally discovering a whole series of dark secrets. Phoebe develops into a great character in the course of the story. Mama is a member of the Hallelujah Army, campaigning against the sinful theatres, whereas Phoebe has identified herself with Cissie, enjoying the occasional secret trip to the music hall. She feels pressured into accepting what happens to her at the start of the novel, but throughout, she takes every opportunity to find out what is happening, listening to conversations and chatting to the Samuels’ servants. Towards the end of the story, she has become a tough, independent young woman who has learned much from her own family and from the Samuels, and can make her own choices. The other characters in the story are also interesting and complex, as Phoebe frequently sees different facets of the people around her. I thought the portrait of Phoebe’s difficult and changing relationship with her mother, as she takes on very different values and perceptions, was particularly well portrayed. The Somnambulist is a story of places as well as people, with several different settings, including a middle class home in Bow, the theatres and music halls, the East End and the Samuels’ great house, Dinwood Court, in the Herefordshire countryside. I really loved the Author’s Note at the end of the book, an 11 page account of the places and other bits of the historical background to her story. Wilton’s Music Hall in London’s East End and Tredegar Square, Bow where Phoebe and her family live, the nearby Victoria Park and others are real places which still exist. Dinwood Court, is apparently based on Hampton Court and two other nearby stately homes. Fox also credits some online sources for her research, and admits where she has taken liberties with reality and changed things for the purposes of her story. The title of the novel is taken from a painting by Millais, showing a woman sleepwalking. 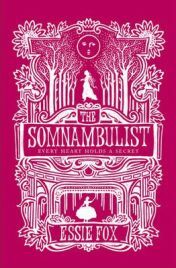 The Somnambulist is an engaging, intelligent good read which might well appeal to those who like Sarah Waters, Charles Dickens and other contemporary and historical writers who have set their fiction in Victorian London. I recommend it and will certainly read Essie Fox’s future work. I received a free copy of The Somnambulist through the Amazon Vine programme. One Comment on "The Somnambulist"